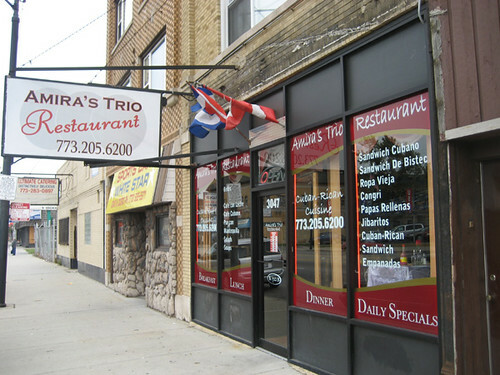 For my latest restaurant-not-widely-talked-about-on-LTHForum-or-anywhere-else, I was going to write about Amira’s Trio, a Cuban-Puerto Rican spot on Cicero a little north (on the other side of the street) of Sol de Mexico. But there was enough personality and pizazz in this little but attractive and friendly spot, especially given its owner, Vicky Amira, that I saw a chance to sell a piece on it— and so it appears this week in Time Out Chicago’s Save This Restaurant column. So read it there, and then, believe me, you won’t regret a visit to Amira’s Trio, the archetypal welcoming family-run restaurant, clean and neat enough that you can even take people who don’t share your taste for ethnic dives, as long as they love good, hearty comfort food— and being fussed over by a warm, maternal owner. 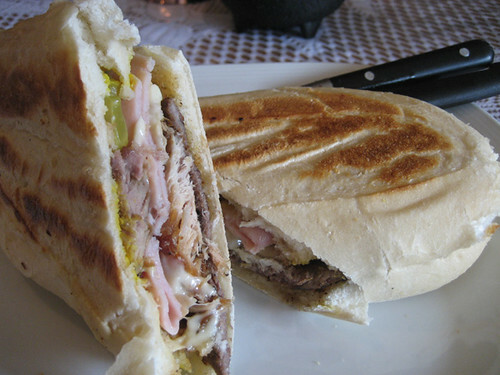 The Cuban-Rican, half Cubano, half Jibarito. To see more in this series, click Restaurant Reviews at right and look for the numbered reviews.